Villa Pablo is an amazing luxury villa - truly unique - unlike any vacation home you’ll ever stay. The design is hyper-modern, inspired by football legends and the estate even boasts its own football field. 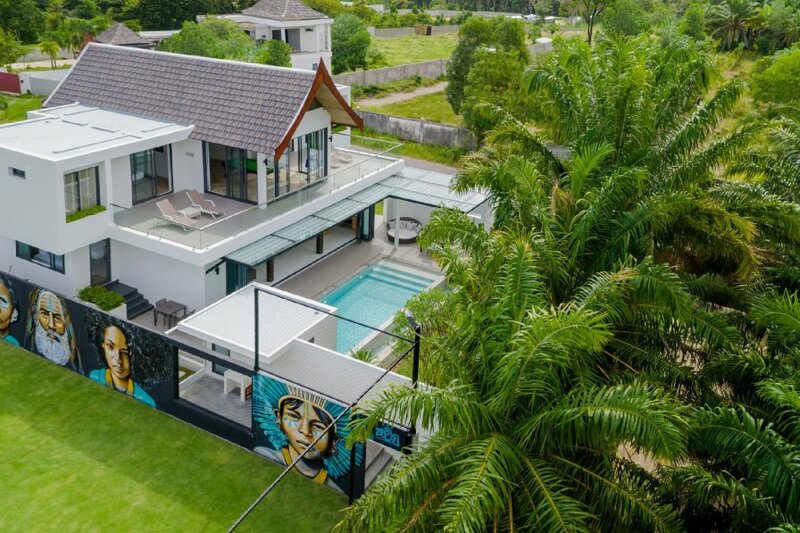 Villa Pablo is part of Picasso Villa Complex, which houses Villa Pablo and its sister Villa Paloma - the football field lies in the middle of these 2 luxury retreats, captured between walls with beautiful floor-to-ceiling mural paintings. Villa Pablo is located near to Bang Tao Beach and the direct surroundings are wonderfully peaceful and tropical. The villa houses 5 bedroom suites in total, making it a perfect island stay for large families, groups of friends and football enthusiasts. The architectural design is as striking as the interior design. Villa Pablo featuring vaulted ceilings, full-length glass walls, quirky wall-paper and unique football artefacts such as rare posters and T-shirts with autographs of football legends, wrapped around the dining chairs and sofa cushions. The living room has an open-plan design, allowing you to plunge straight into the pool anytime you feel like it. In the evening, you can close the glass bi-fold doors and get comfy on the sofa to watch a movie, a football game or your favourite TV show. The kitchen is fully equipped with everything needed and it’s got a bar with high chairs to sit and have drinks together. Upstairs, you will thrill to find an entertainment hub boasting a billiard table overlooking the lush green hills of Phuket. From here, you can access the large, sunny outdoor terrace furnished with long chairs. A great spot to soak up those views and work on your tropical island tan at the same time! In the garden downstairs, glistens the private swimming pool, topped off with a waterfall feature that adds even more tranquillity to the tropical environment. On the other end of the pool, there is an outdoor deck where you can relax on the round-shaped daybed and dine alfresco style. How tropical and wonderful!